"You don't have the skill to beat me!" Chun-Li's father was killed when she was very young, and she has trained most of her life to gain revenge on his murderer, M. Bison. Using the skills her father taught her, Chun-Li quickly earned a reputation as the strongest woman in the world. After some time, Chun-Li finally received clues as to the wherabouts of M. Bison. She tracked the dictator down and attempted to stop him, but Bison severely beat her. He also told Chun-Li that her father had been killed for snooping around his operation, and warned her against doing the same. While Chun-Li was recuperating in a hospital, she was approached by agents of Interpol, who hired her to take Bison down. This time, Chun-Li teamed up with Rose to confront Bison. The two were successful in sealing off Bison's power, but Bison himself escaped. Rose considered her work done, but Chun-Li had sworn revenge for her father's death and vowed to track Bison to the ends of the earth. 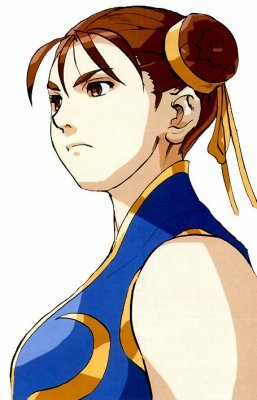 Due to corruption within Interpol, Chun-Li became increasingly powerless as an official and soon switched to active duty again. Upon learning of Bison's Psycho Drive in Southeast Asia, she spearheaded an operation to destroy the Shadowlaw base and end Bison's threat forever. Her Interpol group was joined by a military group led by Charlie, and they managed to find Bison's base in the heart of Thailand jungle. They had planned to bomb the facility, but were unable to do so. Instead, Chun-Li and Charlie led a group into the facility to arrest Bison and destroy the Psycho Drive from within. This attempt went sour as well, but Charlie sacrificed himself to destroy the base. The group barely made it to safety before the base exploded. Chun-Li was dissapointed, however, when she saw Bison fleeing from the destroyed base. Chun Li continued to track Bison's movements, waiting for an opportunity to strike. It came when Bison sponsored the second World Warriors tournament. She was entered into the tournament by Interpol, to bring Bison in for his crimes. This time, she found she had more allies in the fight against Bison, Guile and Ryu. Ryu especially was of help to Chun-Li, helping her better control her Kikoken fireball. She took a liking to the wandering warrior, but revealed it to no one. Bison was aware of Chun-Li's entrance into the tournament, and sent Vega after her. She barely beat the assassin, but was badly injured. Although hospitalized, she helped Interpol track down the rest of Bison's criminal empire. After Bison had been defeated, Chun-Li took a long vacation from Interpol. In the few years following the tournament, Chun-Li attempted to stay in touch with Ryu through Ken. However, Ken grew tired of trying to track Ryu down and stopped delivering her letters to him. Chun-Li eventually gave up on Ryu, and was called out of retirement to keep tabs on the mysterious warrior Gill. She entered the third World Warriors tournament to keep a closer eye on Gill, and rescued Sean from captivity. Little is known about what happened to Chun-Li after Gill's defeat. -Chun-Li means beautiful spring in Chinese.